Every so often, we bloggers are sent products to review from different companies. 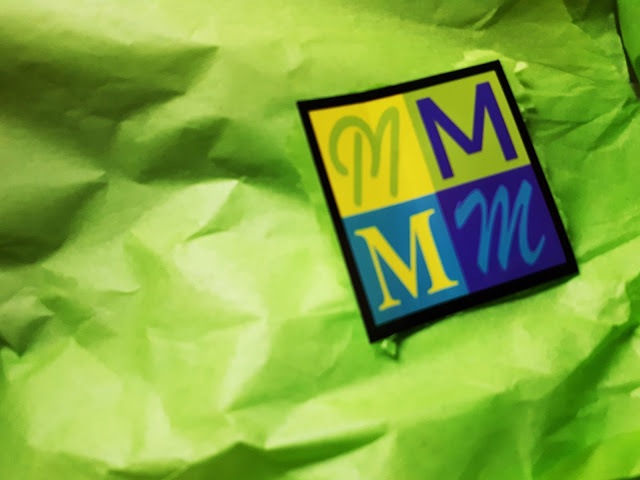 I was lucky enough to be accepted by M Squared Brands. 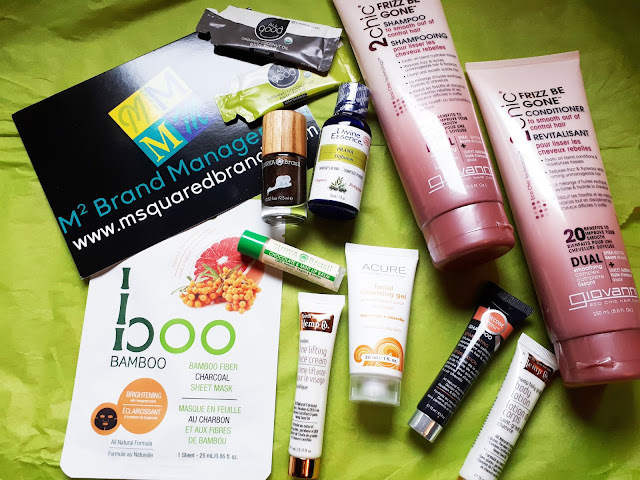 They send out seasonal blogger boxes, with their main focus being on natural and organic products, available to Canadians. This box is the Fall/Winter edition! As always, everything came wrapped inside this bright green tissue paper! It's always so bright and cheery! There is always a great assortment of products, so let's get a better idea of what was included. The original creators of Boo Bamboo, who spent their entire careers working in the hair care industry, know that you don't have to compromise performance by going natural!! All of Boo Bamboo's products use certified organic bamboo extract at the highest possible concentration. Rich in silica, minerals and organic proteins, bamboo extract helps strengthen your hair and improves your skin's ability to retain moisture, delivering dramatic results after just one use. Boo Bamboo formulas are completely biodegradable, cruelty free and vegan, and use food grade flavouring for the fresh scent (perfect for sensitive skin). I've tried other boo bamboo sheet masks, and they fit great. This was no different! It's saturated with a lot of essence, but it's not messy. It feels cooling on the skin. They recommend you wear it for at least 10-20 minutes.. but I find I can wear it even longer and it still feels damp. It's always relaxing to put a mask after a long day. Although I didn't find this brightened my skin after one use, my skin felt refreshed, and very soft. The mission began with Caroline, a massage therapist and outdoor enthusiast who, after working in emergency care on an ambulance, had the vision to create a product that would harness nature's power to heal. Since her All Good Goop Healing Balm in 1997, the company continues to grow with a diversity of body care offerings inspired by the very first product, and using their own organically grown calendula. Purchases of All Good products directly supports environmental restoration and education projects through their partnership with 1% For the Planet. This looks like it's just coconut oil for the skin. It recommends to apply after a shower for baby soft skin. I can't wait to give this a try. Winter makes my skin so dry, so any added moisture is welcomed in my book. I'm also curious to try this on my cat. I know that it is odd to say, but he gets allergies at the end of Fall and it causes him to scratch a lot. Coconut oil will calm his skin and make it a little less dry. I'll report back. Surya Brasil has spent the last 20 years unearthing the therapeutic performance of exotic botanical ingredients like buriti, murumuru and cupuaçu from the Amazon and combining them with ancient plants and herbs like 'Henna' (Lawsonia inermis) a flowering plant and Brahmi, a scalp soothing botanical from India to create the company’s best selling natural henna color formulations, hair care and skincare. The founders of Surya Brasil are actively committed to veganism as well as environmental & social responsibility. I'm glad I got this nail polish shade in a bronzed colour. I don't have one in my collection and it's perfect for Fall, although we're kind of going into winter now. It's bronze with gold and red micro glitter. I like that it is 7 free, cruelty free, and vegan. There is a whole "exotic animal" line - where they focus on colours based off of those animals going extinct. It dries fast, and has a large brush. And, chocolate mint lip balm? Another perfect product for this time of the year. At Divine Essence, they are passionate about aromatherapy and science. This proud Canadian producer and importer offers the largest selection of premium quality, certified organic essential oils, floral waters and cosmetic products. To do this they have developed long-term partnerships and fair trade practices with family-owned artisan distilleries from all over the world. These producers are devoted to honouring ancestral knowledge. Combined with organic certification, Divine Essence ensures superior plant and oil quality and source sustainability. I'm not sure this would be a scent that I would reach for, but I'm willing to give it a try! This oil can be used in a diffuser, or in the bath. Since I don't have a diffuser, I will have to give it a try in the bath. I'll report back on this one as well! The original creators of North American Hemp Co., who spent their entire careers working in the hair care industry, know that you don't have to compromise performance by going natural!! North American Hemp develops the highest quality, all natural, environmentally friendly, consumer products that deliver results exceeding consumer expectations. 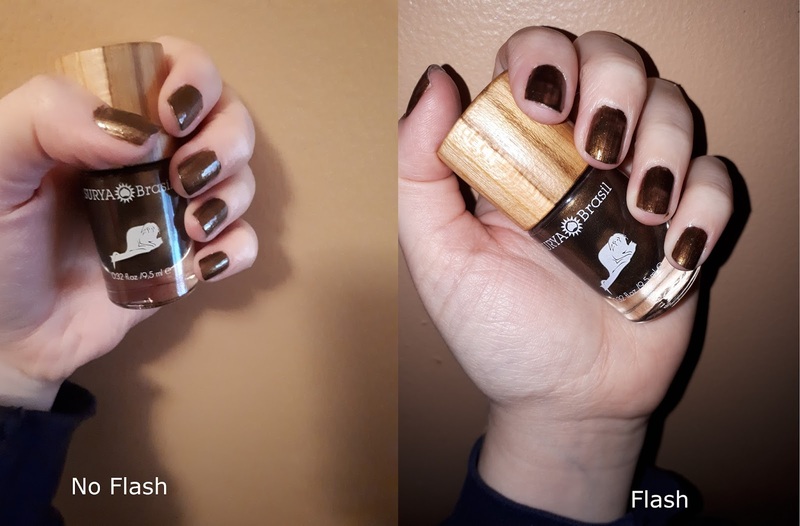 Always vegan & cruelty free, and made in Ontario. As I mentioned before, Winter is coming and this weather dries out the skin. I'm excited to try a line lifting cream and body lotion - especially since they are vegan and cruelty free. I'll give another review on these when I give them a good try! Acure highlights their commitment to creating effective personal care that steers people away from the toxic chemicals typically connected to illness and disease, allowing them to discover that you don't have to sacrifice your health for beautiful skin and hair. Acure is on a mission to provide sustainable personal care products of the highest quality that are fair trade, natural, and certified organic. Their products are made with plant and food based ingredients and are free of parabens, sulfates, phthalates, petrochemicals or animal bi-products. With clinically proven results that without the use of gluten, synthetic preservatives or fragrances, they can provide scientific nutritional support to enhance the skin's own ability to regenerate optimally. This specific cleansing gel is for combo to oily skin - which kind of scares me. Products that are targeted for those skin types generally dry out drier skin. I'll still give it a try, but if I find that it is a little too drying for my already dry skin, I know who I can pass it off to, who will greatly appreciate it! Giovanni was the first full-range, salon-inspired hair care brand in natural stores and today is the #1 selling Hair Care line in the US natural industry. To Giovanni, innovation was not only creating a chic alternative, but offering the natural consumer a world of sophistication never before seen in the natural channel. A true industry pioneer, Giovanni has brought new life to the category, allowing consumers to achieve their own unique look and style without compromise. Giovanni is committed to creating only the highest performance formulations, wrapped in aesthetically beautiful packaging and marketed with extraordinary visuals and graphics. I have such frizzy hair, especially in the winter. So looking for products that combat that, can sometimes be hard to find. I can't wait to give this a try! Decode personal care products are clean, natural, high-performance products designed for men. All Decode products are proudly designed and manufactured in Canada at facilities located in Ontario. They believe that men should have their own personal care products designed to make daily grooming easier and that natural shouldn't mean sacrificing performance and quality. These products are designed with highly effective formulas that keep you feeling clean and fresh while containing only the most natural ingredients. With Decode, you can get ready confidently knowing that there are no synthetic fragrances or harsh chemicals hiding anywhere in your daily routine. For everything from body cleansing and shampoo, to shaving and hair styling products, Decode products take the guesswork out of getting ready. I can't wait to pass these on to my bf. I hope he enjoys them! He will have to keep us updated on how he liked these products, or not! A huge thank you to MSquared brands for giving me the opportunity to try these natural products. And if you're interested in giving any a try - all of these products can be purchased at well.ca!